The Oxford Lab Products BenchMate Light Single Channel Mechanical Pipette sets a new standard for manual pipetting. The BenchMate Light mechanical pipette was designed around 4 critical performance areas; comfort, fatigue reduction, durability and precise and accurate pipetting. A true testament to Oxford engineering, the BenchMate Light mechanical pipette enhances scientists’ ability to pipette for longer periods of time while maintaining a consistent level of accuracy and precision, therefore generating the most accurate results. The BenchMate Light Single Channel Mechanical Pipette is equipped with the smoothest plunger force on the market. This reduces the force needed to eject a tip, and thus improving ergonomics. The BenchMate Light Single Channel Mechanical Pipette also has a lightweight and durable design. It is fully autoclavable at 121 ˚C for 20 minutes. Besides this mechanical pipette line, the Oxford Lab Products pipette range also includes the BenchMate Electronic Pipette, therefore providing scientists with more options. Smooth plunger force – 70% less force required to depress the plunger and eject a tip. Enlarged volume display for quick and easy volume verification. Easy to use single-handed operation with a locking mechanism for maintained accuracy during repeated pipetting of the same volume. Enhanced traditional design eliminates the need to tightly grip the pipette when pipetting, thus improving ergonomics. A premium sealing ring is used to ensure accurate and precise pipetting over long-term use – the ring has been tested 600,000 times. The durable plastic provides higher tolerance to abrasive solvents for long life. The pipette is fully autoclavable at 121 ⁰C for 20 minutes. 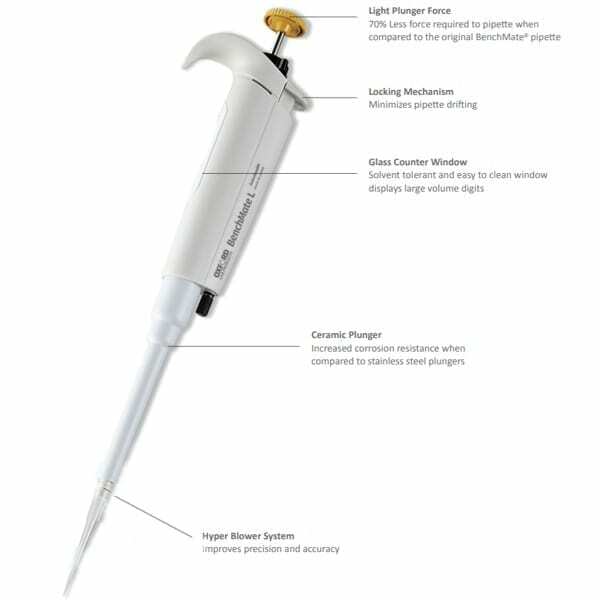 The ceramic plunger ensures greater durability for pipettes ranging from 100 µL to 1,000 µL. Improved dispensing accuracy and precision for micro volumes between 2 µL and 10 µL due to the hyper blowout technology. The premium internal components reduce wear and tear for continuously precise and accurate results over long-term use.